Four anglers got a big surprise when they went out looking for swordfish this past weekend—but it wasn't the swordfish they caught that had the local fishing community talking. Captain Austin Ensor and his crew took the Primary Search, a 28-foot Carolina Classic, outabout 50 nautical miles from Ocean City to Poorman's Canyon. Crew member Brian Stewart tells Bay Bulletin they wanted to take advantage of the flat, calm seas, and started deep-dropping for swordfish. The crew, which also included Tommy Clark and James Doerzbach, caught one swordfish around noon. Then, says Stewart, "we decided to make one more drift to see if we could catch another one before we had to head home." The Primary Search got a bite as they were dropping the bait down. Stewart says the guys weren't really sure what they had until they got it to the surface, though they guessed it was probably a decent-sized tuna. 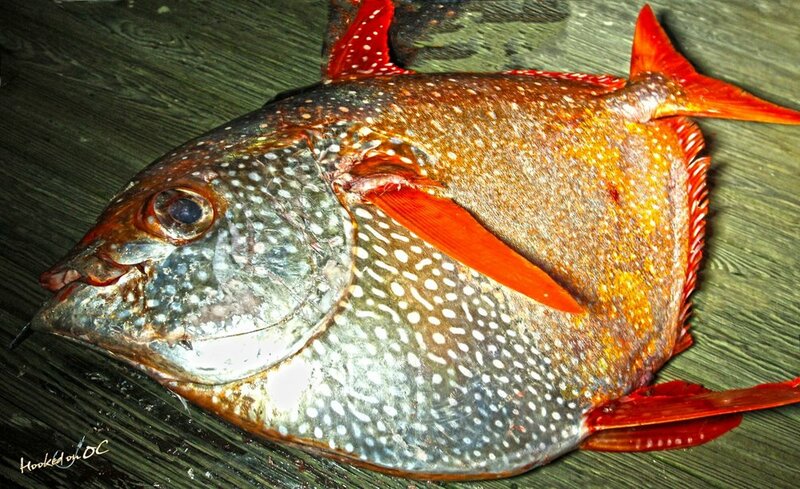 They say it turned out to be an opah, also known as a moonfish. Opah are large, colorful, deep-bodied pelagic fishes usually found in deep, open-ocean waters and are particularly pried by anglers for their large size and attractive form. The opah is also the only known warm-blooded fish, and can keep its body consistently above water temperature. It can grow more than six feet long and weigh up to 600 pounds. The Maryland Department of Natural Resources hasn't yet verified the catch, but if confirmed, it is far outside of the range where opah are usually seen. Because of their regional rarity, the Ocean City opah catch caused quite a stir. Stewart says when they finally got back to shore, there was a crowd waiting for them on the dock, most of whom had heard of the fish, much less seen an opah firsthand. Captain Ensor documented the catch and filleted the fish, and each crew member took a bag home to eat. The opah is a popular fish to eat, especially in Hawaii. It sells for $20- $25 per pound in U.S. markets.